In the same way it is impossible to describe a colour solely through the use of aromas, it is beyond even the greatest poet’s ability to do justice to the yearning, defeated sonic ballet that is Pansori via application of words alone. The traditional Korean art form, consisting of a female voice and percussive accompaniment, is a sparse symphony of sounds bleeding together to create a siren’s wail of achingly visceral pain – it is the music of the suffering; a style which can not be intimated by those who do not know what it is like to gestate in the womb of pure sorrow. Describing Pansori is, to paraphrase a wise man, like dancing about architecture. It is this art form which provides the backdrop for Im Kwon-taek’s 1993 masterpiece Seopyeonje - a melancholy oil painting depicting wretched, agonising hardships inflicted on a human soul and the stoic, rhapsodic melodies which are summoned, mournfully, almost in spiritual defiance. Im's film details a Korean family of the 1950s attempting to make a living through traditional Korean art forms - Yu-bong (Kim Myung-gon), the patriarch, believes that sincerity is the key to his family's performance and, in order to invoke the suffering that is essential to Pansori, one must endure the bleakest of lives. His adopted children, Dong-ho (Kim Kyu-chul) and Song-hwa (Oh Jung-hae), are reared with a sterility bereft of affection, trained rather than loved, his paternal instincts cruel rather than compassionate. 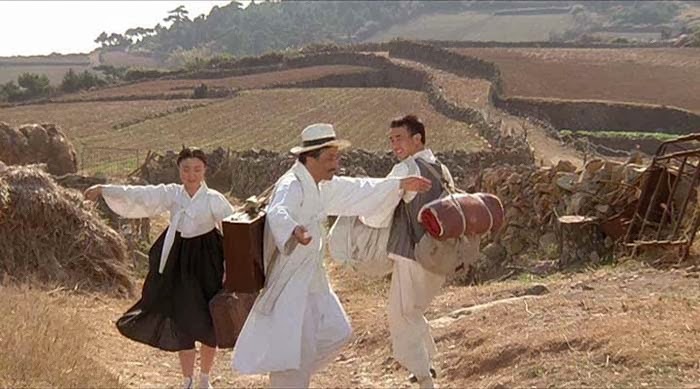 One day, Dong-ho arranges to escape despite his sister's hesitance. Years later his attempts to track her down result in some rather devastating and uncomfortable truths when her fate is revealed. Seopyeonje, a slow film that lingers in the moment, meditates in suffering, is framed by Im with a painterly eye and, despite a nihilistic, brutal subject, is lensed with pastoral beauty. A starkly moving film about misplaced passions, in which Yu-bong misunderstands that parental sacrifices should be made by the parent and not on their behalf, Im's glorious movie polemically combines transcendental serenity and lightness of touch with visceral, wrenching hurt. Often communicating the most haunting of sorrow with the eloquence and grace of silence, Seopyeonje is one of the true classics of modern cinema and a morose reminder of the suffering caused when desire to achieve is inflicted on others no matter what the cost. With the brutal education system many Koreans persist through, and the alarming suicide rate of the country's young citizens, Im's powerful movie seems as pertinent as ever.